Fighting to Save the Family Farm! You can filter out fluoride. You can remediate radiation. You can compensate for just about every type of soil or atmospheric condition, but there is no filter or remediation technique in existence for lab-based genetically engineered organisms (GMOs). They’re called transposons, mules, mobile DNA, or jumping genes, and they naturally mutate. They are in almost all species of life on planet earth. Transposable elements (TEs), also known as “jumping genes,” are DNA sequences that move from one location on the genome to another. These elements were first identified more than 50 years ago by geneticist Barbara McClintock of Cold Spring Harbor Laboratory in New York. Biologists were initially skeptical of McClintock’s discovery. Over the next several decades, however, it became apparent that not only do TEs “jump,” but they are also found in almost all organisms (both prokaryotes and eukaryotes) and typically in large numbers. For example, TEs make up approximately 50% of the human genome and up to 90% of the maize genome (SanMiguel, 1996). Jumping genes ”can move from one site in a chromosome to another site in the same or a different chromosome and thus alter the genetic constitution of the organism,” and they are found naturally in almost all organisms. This is an inherent property that comprises 50% of the human genome, and they are subject to mutation. And now, we are eating genes in our food that were actually designed to jump species, thanks to biotechnology. Are we facing wholesale genetic mutation? GM constructs are designed to jump into genomes. Unfortunately, they can also jump out again, to invade other genomes. GM lines are well-known to be unstable, partly because the integrated GM construct can be lost (4), and the viral promoter makes it worse. Experiments have shown that GM genes can transfer from plants to soil fungi and bacteria. Two German geneticists monitored fields where GM sugar beet was planted (5). They found that the GM construct has persisted in the soil for at least two years after the plants were removed, and some bacteria in the soil may have taken up different parts of the construct. Since jumping genes are already a large part of our genome naturally, and they are subject to mutation, which can lead to diseases such as cancer and hemophaelia as well as antibiotic resistance, the introduction of genetically engineered DNA into the mix is especially alarming. A segment of DNA that is capable of independently replicating itself and inserting the copy into a new position within the same or another chromosome or plasmid. Transposons act somewhat similarly to viruses and in humans are an underlying cause of hemophilia, certain cancers, and other diseases. In other organisms, they can become a permanent and even beneficial part of the genome, as in maize corn, where transposons account for half the genome, and certain bacteria, where genes for antibiotic resistance can spread by means of transposons. Also called jumping gene. 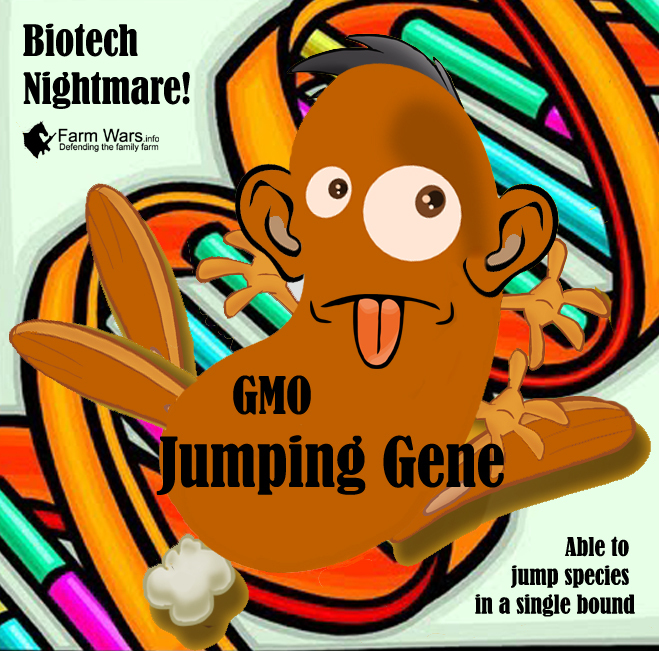 Spontaneous mutation of these jumping genes cannot be controlled, especially when combined with completely foreign, unknown DNA sequences that are designed in a lab to jump species. In fact, according to Jeffrey Smith, the tissue culture process used in genetic engineering activates transposons, and is a major factor for the resulting genome-wide mutations. How does DNA mutation occur? Notice this statement in the above quote: “Repair enzymes recognize structural imperfections between improperly paired nucleotides, cutting out the wrong ones and putting the right ones in their place.” Can these repair enzymes recognize DNA that has been mutated by the GMOs that we ingest? Defects in DNA repair underlie a number of human genetic diseases that affect a wide variety of body systems but share a constellation of common traits, most notably a predisposition to cancer (Table 2). These disorders include ataxia-telangiectasia (AT), a degenerative motor condition caused by failure to repair oxidative damage in the cerebellum, and xeroderma pigmentosum (XP), a condition characterized by sensitivity to sunlight and linked to a defect in an important ultraviolet (UV) damage repair pathway. In addition, a number of genes that have been implicated in cancer, such as the RAD group, have also been determined to encode proteins critical for DNA damage repair. According to Dr. Arpad Pusztai, molecular biologist, GMOs are foreign to the human body when ingested, and are treated as invaders. Foreign genes are introduced to the human body via GMOs, which our bodies do not recognize and attack as foreign invaders. These same foreign invaders were designed to transfer between genomes, so the ones that survive do what they were designed to do and incorporate into the human genome. What we now have is a recipe for an increase in mutations via horizontal gene transfer the likes of which no one has ever seen due to spontaneous changes by genetically engineered DNA combined with transposons inherent in almost all species. What exactly are we opening ourselves up to with the introduction of potentially unrecognizable, genetically engineered DNA sequences designed to jump species that the body has no adequate defense mechanism for? What happens when our body’s repair mechanisms go wrong, and what happens if they don’t recognize the DNA they are supposed to repair? Are we setting ourselves up for genetic Armageddon? Like it or not, we are about to find out.